I had hopes of masses of colour dripping from the arches this summer but it was not to be quite as I had hoped. Although my exploding cucumbers and canary creeper (see past posts) have done well and are threatening to swamp the blackberries, everything else found the conditions in June, immediately after planting out, were just too tough: cold and dry with vicious winds. But a few plants of Mina lobata have survived and although I wanted them to be 3m high by now (which is entirely possible) they are more like 30cm! Even so, in their stunted state, they are trying to flower and if we get some decent late summer weather they may put on a tardy spurt of growth. You may not think so at first glance, or even at a second glance, but this plant is very closely related to ipomoea. If you look closely at the flowers, which are white, you will see that the narrowly funnel-shaped flowers are similar but most of the colour of this plant is provided by the calyx and not the flower itself. When young these are rich orange and as they get closer to the flowering stage they pass to yellow and finally become white as they split to allow the flower to appear. This combination of colours has led to it being called Spanish flag. Grown easily from seed sown in heat in spring it is a twining annual that has three-pointed leaves and dark stems. In good soils or in a pot of good compost in a sheltered, sunny spot it can easily reach 3m high. Quite why this is not more commonly grown, even with the poor results I have had this year, I cannot fathom. It is bright but unusual and although the individual flowers are small they are abundant, held more or less horizontally on bifurcated, upright stems well away from the dense foliage. This plant is a humming bird’s delight. It is native of Mexico and was introduced into Europe in 1841 though it is thought that it did not remain in cultivation for long. This is surprising too since it usually sets plenty of seeds. 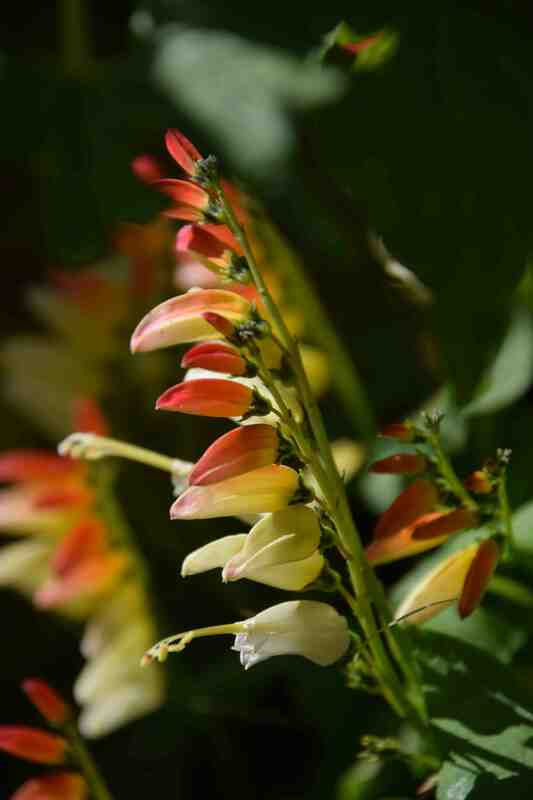 The name Mina is named for Don Francisco Xavier Mina, a Mexican priest and lobata means lobed, referring to the leaves. Another name you may come across is exotic love – heaven knows why. I have no experience of such things but I think you have to pay more than the price of a packet of seeds for that!